Sheldon Candis’s LUV is one of the strangest yet better coming-of-age films I have seen. Above all else, this film excels in its character development, which is probably why Candis was able to secure an A-List cast. 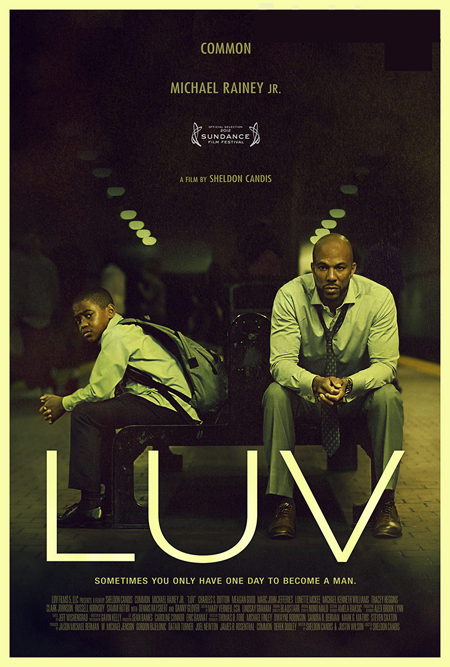 LUV is set in Baltimore , which undoubtedly will prompt comparisons to the HBO hit series The Wire, particularly because of the similarities in characters and story. But where LUV differs, is when it makes its characters come first before anything else –even the storyline. We meet Woody (Michael Rainey Jr.), a bright young boy who lives with his grandmother in Baltimore after his mother was checked into an out-of-state drug rehab clinic. Woody’s uncle Vincent (Common) moves-in after being released from prison, where he served eight years of a twenty year sentence. Woody has been without a father all of his life, and we see him searching for a parental figure as he instantly takes a liking to Vincent who drives a Mercedes and dresses in a sleek suit. Trying to impress his uncle and get is affection, Woody boasts about how popular and cool he is at school around his peers. But, when Vincent drives Woody to school and discovers that Woody lacks the confidence to even talk to a girl, Vincent decides that life lessons are far more important than reading, writing, and arithmetic. He take his nephew with him for the day to teach him how to be a man and how to navigate the real world. The day starts out charming enough with Vincent teaching Woody how to talk to women, dress for success, demand respect, and always maintain the appearance of confidence despite any underlying fear. Vincent teaches him how to shake people’s hands, look people in the eye, speak loudly and clearly, and never take no for an answer. Common pulls this off with his outstanding wit and charm. He’s very likable. Woody accompanies his uncle to meet a friend from his old days of crime. They then go to a bank, where Vincent is told he cannot receive a new business loan (he wants to convert an abandoned waterfront warehouse into a crab restaurant) until he pays off an outstanding loan of $22,000. In both scenes, we see Vincent trying to stay clean and avoid returning to his past gang life. But with his options limited, it is clear he decides to resort to his past life one last time. This is where the story and characters get a bit idiotic and unrealistic. Vincent calls his old crime boss Mr. Fish (Dennis Haysbert) and his partner/brother Arthur (Danny Glover) to ask for an opportunity to earn the $22,000. Mr. Fish tells Vincent he needs to do a drug run in order to get the money. Vincent and Woody make the drug run only to find out that Mr. Fish has set them up. Mr. Fish orders Vincent’s murder because he thinks Vincent is either an informer or a snitch . Luckily, Vincent and Woody make it out alive by killing the opposing threat. Woody’s lessons on how to be a man suddenly includes instructions on how to drive, shoot a gun, and do drug deals. This all leads to the climactic scene at Mr. Fish’s house where a big gunfight ensues. In the last 30 minutes of the film, the story becomes even more outlandish, to the point of being laughable. When Woody drives a getaway car where he can barely see over the wheel, pretends to be a crime lord, and shoot guns, the plausibility of the film leaves the room and never returns. But where the storyline loses credibility, the character development keeps us grounded. Even with the bizarre last thirty minutes of the film, I still recommend that you give LUV a chance. The performances by Common and Rainey were incredible. They both showed great range as they evolved from kind and likeable people into hard-edged gangsters. And as always, Dutton, Glover and Haysbert were phenomenal in their supporting roles. It was great to see Glover and Haysbert play bad guys. Candis has a great eye for filmmaking; the film was skillfully shot and is a fresh, clean glimpse of the standard gang film. This entry was posted on Monday, April 30th, 2012 at 11:31 am	and is filed under Film, News. You can follow any responses to this entry through the RSS 2.0 feed. You can skip to the end and leave a response. Pinging is currently not allowed. « Here’s a New Trailer for Aaron Sorkin’s HBO Series, ‘The Newsroom’! !